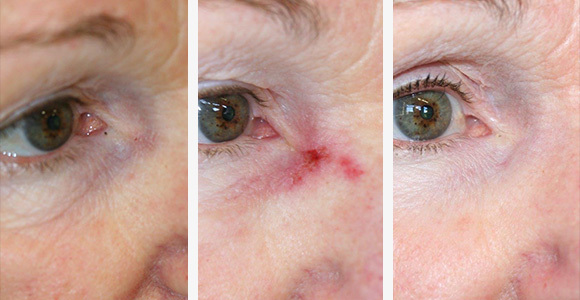 Our skin can have a number of different lesions and blemishes. Most are non cancerous while some are malignant. The first important step is getting a thorough examination. Dr Mills uses dermoscopy to assess your skin. Dermoscopy is the examination of the skin using high power magnification combined with a powerful lighting system. However, it is also important to combine this examination with a thorough knowledge of skin lesions. Dr Mills has 20 years experience in assessing and treating skin cancer. The main cause of skin cancer is sun damage. There is a spectrum of damage that is commonly seen. 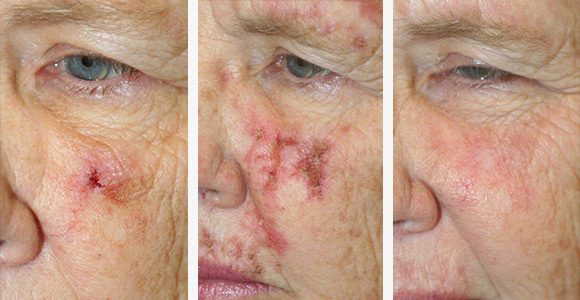 Sun damage alone can result in a loss of elasticity of the skin along with dryness, altered pigmentation and blemishes as well as dilated blood vessels (telangiectasia). High quality Skincare can be very beneficial in treating these changes. Small dry crusty lesions called actinic keratoses or solar keratoses can appear. These are not skin cancers but can sometimes progress on to become a skin cancer. Skin Cancers due to the effects of chronic exposure to the sun are usually basal cell carcinomas (BCCs) or squamous cell carcinomas (SCC) while melanoma seems more related to sunburns ( especially those in early life). BCCS can basically be divided into 3 types: superficial, nodular or infiltrative. The types of SCC are determined by how different the cancerous cell is from a normal cell. The most superficial SCC is an SCC in situ. If the SCC is just a bit abnormal then it is called a well differentiated SCC; a bit more abnormal is moderately differentiated and very abnormal poorly differentiated. A special variant of SCC is the keratoacanthoma. This lesion classical grows very quickly for a month forming a round raised lesion with a central crust. It then stays about the same size for a month and then may disappear over the next one to two months. There are 3 common ways that Dr Mills treats certain skin cancers non surgically: liquid nitrogen, Efudix, Aldara. Liquid Nitrogen is used by spraying it on the lesion. The temperature is -195.8C so this creates a burn to the area. It is particularly useful for burning off isolated lesion especially actinic keratoses. It stings at the time of administration, the area gets swollen and then a crust forms which drops off after about 10 days. It can be used on actinic keratoses, superficial BCCs and SCC in situ. It is also a very good way to treat harmless lesions like seborrhoeic keratoses. 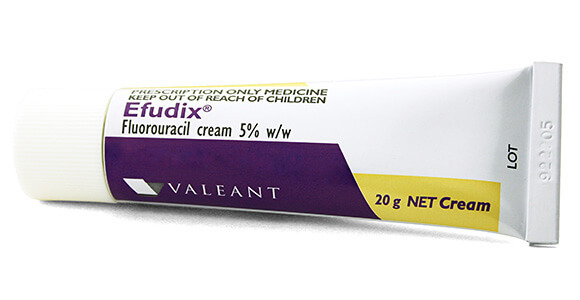 This is cream 5 fluoro-uracil and it works by interfering with the DNA of the cells. It is applied sparingly to the lesion twice a day. On the face it is used for 10 days to 3 weeks, while on the limbs and trunks for about 4 weeks. It causes the area to go red and inflamed and the lesion will then go crusty. The crust comes away about 10 days after stopping the Efudixand the lesion has gone. There maybe some residual redness which usually goes in a further 3 weeks. Efudix is particularly good at treating actinic keratoses and SCC in situ. As we get older our immune system is not as good at recognizing the presence of abnormal cells and skin cancers. 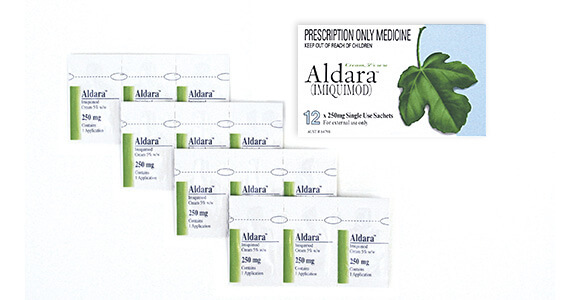 Aldara (imiquimod) stimulates the bodies immune system to recognize the abnormal cells and then to destroy them. It comes in individual sachets as the cream is unstable in air. Use only one sachet per treatment, discard the rest if not required. Aldara is indicated for treatment of actinic keratoses or superficial BCCs. With actinic keratoses treatment is 3X/week for a month (Mon, Wed, Fri) and then reassess as another month may be required. Treatment of superficial BCCs is 5X/week for 6 weeks. The area being treated usually goes red and inflamed about 10 days after starting treatment and will then get a crust which comes away after 10 days. With all of the non surgical treatments it is important to be monitored and followed up by Dr Mills to ensure treatment has been successful.